This informal history traces battle tactics and military strategy from the time of the city-states' phalanxes of spearmen to the far-reaching combined operations of specialized land and sea forces in the Hellenistic Age. 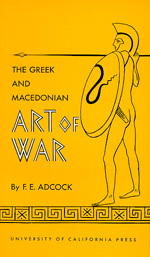 The author first describes the attitude of the Greek city-state toward war, and shows the military conventions and strategies associated with it. He then recounts how the art of war gradually evolved into new forms through the contributions of such men as the great commander Epaminondas, Philip of Macedon, his son Alexander the Great, and others. He also discusses the independence of land and sea power, describes the first use of calvary, and tells of the ingenious Greek devices of siegecraft, including the "fifth column."